I called my friend Amy from a bookstore as I stood before a row of beautiful journals. She answered the phone, and I sobbed, “I’ll never know my child’s favorite color.” I stood there weeping as I realized yet another aspect of my child that I would never know. During the first months of my miscarriage, I often thought of what I had lost as a result of our miscarriage. Through loss of my baby, I lost a lifetime of getting to know my child. These were my words when on December 4, I noticed the first signs of blood. Already having been through a pregnancy where I almost lost our oldest daughter during the first and the third trimesters, I cringed to think we might be on another roller coaster pregnancy. When I first saw the signs of blood in my second pregnancy, it never occurred to me that we might actually lose the baby. Yet, 15 to 20 percent of all known pregnancies end in miscarriage. One of my pregnancies now contributes to that statistic. When we discovered our pregnancy, delighted is a vast understatement. We had certainly been “surprised by joy” from the title of C.S. Lewis’ book. We were ecstatic and rejoiced in the life within me. But within a matter of days the problems began. I called my doctor who placed me on hormones and bed rest to see if my ovaries just needed a little help. Over the weekend, Chad and I prayed (begged might be a better word) for a second miracle child. We promised to name the child Lazarus (boy or girl) to testify how Jesus resurrected and gave life to the baby. We reasoned with God how his turning this pregnancy around would be a great blessing for the nations. As the weekend progressed, I continued to fight in prayer (and reason with God) but I knew the home of my baby was slipping away. Though my “mommy intuition” knew the facts, still the call from my doctor’s office devastated me. These words spoken softly in my ears were almost unheard because of the vibrating pulse I heard in my head. I think I said, “Thank you for calling” and hung up the phone. I remember hearing a sound come out of my mouth that did not sound like my own voice. I felt the sting of death reverberate through me as I realized the fight was finished; no longer a baby boy or baby girl fought for life inside of me. I felt the excruciating sting that I and the baby had lost the fight. As I heard the words, the hope I had fought to hold to in faith over the weekend evaporated and left a gaping hole of anguish, frustration, and discouragement. I found myself reeling, trying to make sense of the death of one I’d never meet. The finality of the moment sickened me. As a follower of Jesus, I knew my ultimate hope, but the intense longing for someone I would never hold in my arms on earth overwhelmed me. My mommy’s heart pierced, as I realized I’d never meet my precious child this side of heaven. Questions began to bombard my mind and heart. How do you grieve a child you’ve never met, never held, and never even experienced a baby bump? How were we supposed to honor this child and let the child be known? How was I to handle some of the comments people said to me? How do you talk about a child no one will ever meet? Do you talk about them – in your family, to your children, around your friends? How many children do you tell people you have? Do you name the child? How do you remember the child? Do you try to remember? Or forget? Did the pregnancy test lie? Was I really pregnant? What is required to verify pregnancy? When does life truly begin? How big is my baby in heaven? Why am I grieving so deeply? Is it okay? When is a baby marked with the imago Dei (image of God)? What do you remember when everything you think about your child is surrounded by loss? You have no memories, or pictures. You don’t know what they liked to do, what they liked to eat, whether they would be athletic or musical or both? How do you remember the day they should have been born? What about the day you miscarried them? Did I cause my miscarriage? I drank a Diet Coke and pulled two all-nighters to work on my doctorate dissertation. Did I kill my child? What kind of mom am I to “mis-carry” my own child? These are just some of the questions we pondered. But there were much deeper ones – spiritual, theological, spiritual warfare, and more. In later posts, I will discuss some of those questions. But for now, I want you to see that those who lose a child in pregnancy have a difficult road filled with questions – some that can be resolved but others that will take heaven to answer. 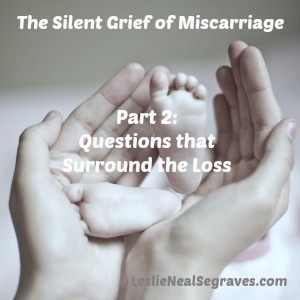 Through my miscarriage, I have come to realize that grief from a miscarriage is be a bit different from the grief of losing a person who has had some opportunity to be known, touched, hugged, sung to, and seen. During the first week of our miscarriage, I lay on the floor with my 11-month old daughter. I lifted her above me. We rubbed noses. She laughed and giggled. Another thought hit me. I would never rub noses with my second child. I would never know the sound of her laugh. The realization caused fresh streams of tears. As I wept, the baby in my arms reached up and wiped away my tears. With Joeli’s hands on my face, I stared into her eyes. She locked eyes with me. By looking at her and feeling her baby breath on my cheeks, I mourned that I would never have this physical connection with my second child. It’s amazing how one so small and unseen claimed my heart so fully. Join the conversation: What are some of the questions you struggled with about your miscarriage?